If you’re new to the roads here in Colorado, you might be a bit nervous about your first road adventure during our high-altitude snowstorms. Fortunately, Colorado has one of the most responsive road clearing services in the nation — the Colorado Department of Transportation has a massive fleet of trucks which plow our roads and lay down magnesium chloride (a de-icer). That said, Mother Nature always has a way of showing her power. We can encounter some of the worst winter weather here in the Centennial State. Denver locals will recall the 2006 blizzard that dumped over 20 inches of snow in a matter of a couple of days. Now, that much snow can shut down a city, but for most of our winter storms, drivers simply need to be aware of slushy and icy roads, lower visibility, and the dangerous conditions that exist on our winter streets. So, today, we’re talking about safe driving tactics for this winter. If you’re new to the area, perhaps renting one of our luxury vehicles, follow our tips to ensure that you stay safe in adverse driving conditions. First thing’s first, know when it is too unsafe to drive. Pay attention to weather reports, and be take extra caution if you don’t have any experience driving in snowy or icy conditions. If your weatherman is telling you to stay off the roads, listen. Remember, even if you are great at driving in the snow, other drivers aren’t. So in truly adverse conditions, you might just consider staying inside. It’s the easiest precaution you can take to ensure that you don’t lose control of your vehicle. Keep below the speed limit (in some cases, you’ll be well below the speed limit). Travel at a speed where you feel confident behind the wheel. And remember, you may have to stop at any point, so drive slow enough so that you can stop at a moment’s notice. When you’re approaching a stop light, a stop sign, or anything that requires you slow down, be sure to slow down early. If your vehicle loses traction, you’ll still be able to stop before you careen into an intersection (or another vehicle). If you can’t see, you can’t drive. Keep your windshield as clear as possible. Scrape your windshield and all of your windows thoroughly before you take off. Be sure to scrape your side mirrors as well. You may have a rear window heater that’ll keep your rear view clear. Also, use your defroster to keep your front windows from fogging up. Be sure that your windshield wipers are in working order, and make sure that the wiper fluid is full — you may have to use fluid to keep your windows clear and free from snow and ice. While you may be tempted to use cruise control on a long journey down I-25, you should be wary that cruise control can cause accidents on icy roads. A car in cruise control can accidentally accelerate or decelerate while on ice patches, and that can cause a loss of control. Instead, keep your foot on the pedal, and be careful. Hills are unavoidable here in Denver; after all, we’re so close to the rockies. If you’re driving through a winter storm, and you’re coming up to a hill, make sure you can get to the top — you may lose traction and slide backwards in extreme conditions. If you’re at the top of a hill, be sure your car can stop. Take it extra slow to ensure that gravity doesn’t take over. If you happen to lose control while you’re driving, steer in the direction that the vehicle is already moving — you may be able to regain traction, and then you can turn or stop your vehicle. Now, you’ll have to be cautious not to overcorrect (by steering past the direction of the vehicle). Overcorrecting can make the car even more out of control. If you have a parked car that won’t gain traction, you can use sand or kitty litter to give your wheels a bit more grit to grip the road. If you have plenty of space, you can also try to rock your vehicle back and forth to get out of a rut. Just be sure to keep from slamming on the gas as you switch from reverse to drive, since your wheels will spin out and create more ice. Well, we hope that you stay safe out there on Colorado’s winter roads. As always, you can count on us for our luxury car rentals. 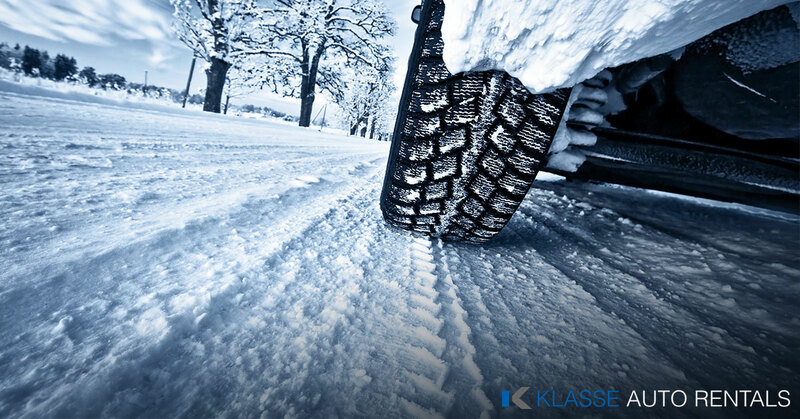 Klasse Auto Rentals is conveniently located right here in Denver. View our rental vehicles, and check availability today!